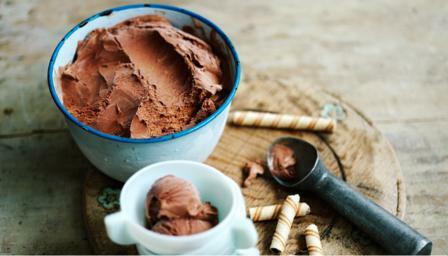 Rich chocolate ice cream: dark chocolate, cream, eggs. Simple. Faultless. Devastatingly delicious. Break up the chocolate and place with the unsalted butter in a warm-ish oven for about 15 minutes. Remove and stir until melted and blended together. Over a low heat dissolve the sugar in the water then turn up the heat and boil rapidly for a few minutes to get a light syrup. It's ready before the syrup takes any colour, when a little dropped on to a cold plate forms a thread when stretched between finger and thumb. Leave the mixture to cool for just a minute.